I should just start calling this thing, "Daily Brownback Campaign D'oh." I am no campaigning expert, but I consider myself pretty astute when it comes to how normal humans will react. And well, the Brownback campaign is blowing the lights out of the Ick Marquee. Yesterday, the Governor and every elected officials slobbered all over New Jersey Gov. Chris Christie. I've tossed and turned this Christie campaign photo op over and over again in my head, and I don't get it. What did the Brownback campaign hope to achieve with Christie Love Fest 2014? I suspect that wasn't the goal. If I had to spit ball, I'd say the goal was to rally moderate Republicans, and if this was 2012 or 2010, I might say that was a good plan. But at this point, Brownback probably ought to be doing everything in his power to rally the base. The base is not happy. I could list all of the reasons Christie is the furthest thing from a conservative, but I'll spare you. Just know that the tough-talking New Jersey Governor is anything but. 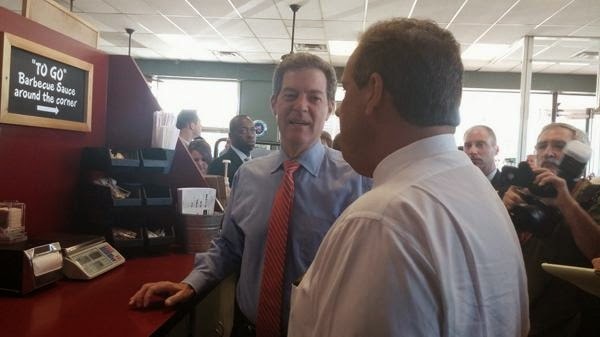 I suppose Christie's trip to Kansas may have made for a successful fundraiser. But what does it say that the Republican Governor's Association is having to spend more than a half million bucks to help secure the second term of a conservative Governor in Red Kansas?